What you should do when the man signs you up then drops you like it ain’t no thing. Create a raw uptempo funker that is all raucous vocals, snappy drums, flaming organ and garage-y guitar. Take that global music megacorps! They certainly will Warner. This is what happens when you dump what’s good for you. You have to listen to a scorching gospel soul burner that’s not on your label. Inspired cover of a gospel traditional – uptempo neck-snap funk drums, righteous guitar and searing organ. This one’s about damnation – coincidentally a milder form of the expletive uttered at Warner A&R when they heard it and remembered they’d dropped Reed. Movin’. Oh what? To a better home? Yes. Another thing you do when your label dumps you. As well as writing a haunting, downtempo organ-led cut. It certainly is – and tomorrow is always a brighter day, right Eli? Hence the cheery ‘keep the faith and everything’ll work out fine’ vibe on this. 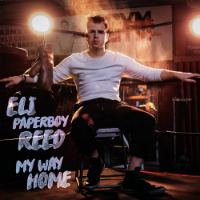 Find your way home Eli! Probably somewhere in the sixties, warmly analogue, rich in tremolo guitar, soul organ grooves and very big gospel hooks. Like a Creedence Clearwater Revival track recorded in the mid-sixties in a dusty little studio tucked away somewhere in Alabama’s back of beyond. Blimey! Gospel garage rock. Truly the lord works in mysterious ways. Banger. I don’t blame you Eli. All those Warner executives giving it large about targeting demographics and profits in the next quarter. It’s because they’ve sold their souls. Best write them something gorgeously bittersweet out of sympathy, yeah? More gospel garage rock! Let it all out Eli. You’ll feel better and you know it’ll sound good. …said one Warner A&R man to the others. Reed drops a closing organ-led gospel slowie to really rub things in.